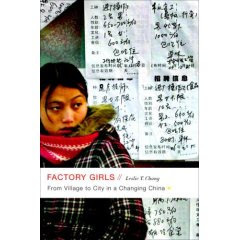 Last weekend China Beat contributors—and longtime Beijing neighbors—Susan Jakes and Leslie T. Chang caught up to talk about Chang’s newly released book, Factory Girls: From Village to City in a Changing China. The book, which builds on stories Chang wrote as a correspondent for the Wall Street Journal (and currently garnering glowing reviews and widespread coverage), follows the lives of young rural women making new lives for themselves in the southern Chinese city of Dongguan. Susan Jakes: How did you decide you wanted to write a book about migrant workers in China? What did you want to try to figure out? Was there a weakness in the existing reporting on this subject that you wanted to address? 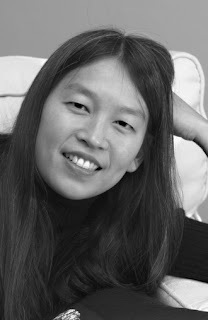 Leslie Chang: The book project began with a bit of an agenda. I had already read some stories in the foreign press, including the Wall Street J ournal, about how terrible the conditions in the factories were. The stories tended to focus on the worst cases, the abuses, the miseries, the horrible bosses, the injuries. They tended to portray migration as a desperate act without much of a pay-off for people. I had a suspicion that there must be more to this, that perhaps things were not so black and white. I also thought that, for a young person coming from a farming village this whole experience in the city might appear very different than it does to us as Western observers. What is it like to leave your village at 16 or 17, to come to a city where you don’t know a single person or only one person, to work in a factory, to earn money for the first time? How does your relationship with your family change? How do your friendships change? How does your worldview change? I thought there must be more to the story. And with that suspicion in mind, I went down to Dongguan in February of 2004. Jakes: How did you pick Dongguan? Chang: I talked with a couple of migrant scholars in Beijing, including Tan Shen at the Chinese Academy of Social Sciences, who was one of the early scholars to work on migrant women. I wanted to find a large city where lots of generally unskilled young people were going to work in factories. I knew that around Shanghai there were a lot of high-tech factories where people with college educations and technical degrees went to work. But I was curious about the large mass of generally uneducated younger people going in cold to factories and I felt that Dongguan was representative of this. Early on I decided I wanted to focus on women because I thought that coming from the village and moving to the city the scope of change might be the most dramatic and maybe the conflicts would also be the most interesting. Chang: I think, in the village, the young women are usually the least powerful and the most restricted, in terms of being expected to marry early, have children and take care of the farm. Obviously these things are all changing with migration. But I suspected that men would still have more freedom and that women would be more restricted. So coming from a more traditional position, I thought that the change in their lives would be more dramatic and more interesting to watch. Jakes: The book revolves around two central figures, Wu Chunming and Lu Qingmin (or Min). What made you pick these two women? Did you see them as representative of migrant women more broadly or as exceptions? Chang: It’s sounds strange to say, but almost everyone I met in Dongguan was representative. They had similar backgrounds: coming from the countryside, having some middle school education and in some cases a bit of high school and poor. That was the profile of almost every young migrant worker I met in Dongguan. But the reason I chose these two women in particular is partly, I think, because they chose me. There were many young women I talked to who would be very friendly on first meeting but hard to sustain a relationship with and get to know. But in the case of Chunming and Min, they seemed to have a curiosity about the world, about me, an interest in learning about this project I was doing at the same time as I was learning about them. It’s very easy to meet people on the street and talk to them for 30 minutes. But to keep in touch, to have them keep in touch with you, to continuously see them over two years—that takes some interest and incentive on their part. Frankly, I’m not bringing much to them. When I say I’m a reporter for the Wall Street Journal they don’t know what that is. When I tell them I’m writing stories about their lives, it’s very abstract to them. I’m not giving them any money. People are sometimes surprised that when I went out to dinner with them, I would pay if they didn’t have money, but if they’d just had a pay day they’d insist on treating me. They never asked me for money or help in any way. So what was in it for them was some sort of interest or curiosity that I think helped us become closer and closer. Jakes: There were also times when you let them read what you wrote about them. How did they react? Jakes: That phenomenon of forgetting what’s happened seems common. I’ve also encountered it in my reporting on migrant workers. Chang: It’s amazing. I think there’s almost a sort of traumatic feeling because people’s lives are changing so quickly that a lot of things are just forgotten. I noticed, especially with the migrants, when you talked to them about the first journey out from home, it was often really unclear, lots of details were blurred. For example, when I talked to Min about her first experience in the city, she said, “My sister took me out, I went into a factory and I left after a month.” And when I asked what happened she said, “I don’t know, I was just so lonely I couldn’t bear it anymore.” That was all she could tell me about that first month in the city. Jakes: Chunming, the other woman you write about, is completely different, She keeps a record of what happened to her, what she’s thinking. Chang: It wasn’t until long after I knew her that she mentioned that she’d written a diary for years and years. I think one of the really powerful things about spending time with someone is that you see all of these interesting things and learn all of these interesting details that they wouldn’t necessarily think to tell you if you were in a formal interview setting. But by hanging out with her, all of these details came up. And one of them was that she kept a diary for probably her first six or seven years living in the city. So I told her that I wanted to read them and possibility write about them and she just gave them to me in batches and I made copies and read them. Jakes: To me, those passages from her diaries are some of the most powerful material in the book. Chang: It was really interesting to see her transformation in such a short time. Her early diaries—when she first came out to the city in 1993 she was 18—the initial things are what you’d expect: I’m making 100 kuai a month, I’m working long hours. She describes in vivid detail her hours, what it’s like to wake up at 6:30 in the morning and know there’s only half an hour until they have to work on the assembly line, the girls fighting to have time to wash their faces and eat breakfast—very physical details of her day. Then she moves up to a position of clerk in her factory. And gradually [the diary] moves from this minute recording of the details of her day and how much money she’s making month by month, to a kind of program of how she can improve herself, her appearance, her image, her speaking, to become suitable to be a white collar worker. In the diary you see her attempts at reinvention, many of them failed. She makes a list of English words she’s going to learn. It starts with words starting with A and by the time she gets to C she’s given up the project. There’s another one: How do we learn public relations? Number one, we learn to be a good person. And then she drops that. She’s testing all of these identities for herself and trying to craft herself into a more sophisticated professional person. And then the diaries take a stranger turn in 1996 after she goes to a direct sales meeting and her diary becomes kind of a manual of how to do direct sales, how to con people into buying all sorts of spurious health products. In the beginning, her diary is a calculation of the money she’s making and how she’s spending her day, and then over time, you see her develop into a person who’s kind of looking for a deeper meaning in life beyond money. Obviously she still worries about her financial security, but she’s also wondering: what is it that’s going to give meaning to my life? Is it this new health product or selling life insurance or being a vegetarian? Jakes: What surprised you most in your reporting on this subject? Chang: I think the main thing that surprised me as I was reporting was just how quickly people’s lives changed. The first time I met Min, she had just talked her way into a clerk’s job, which is kind of the lowest office job, after a year of working on the assembly line. And I really liked her, and I thought, I’ll just follow her life. But there was a big part of me that worried that her life was now very stable and nothing more would happen to her and there would be no more story. Instead, the opposite happened in spades. Every time I saw her there was something extraordinarily different about her. From her perspective something major had changed, whether it was a job or boss or hairstyle or some fight with her family. So even though I went down there expecting that people would go through changes, the sheer enormity and speed of the change really surprised me, as did the fact that the pace at which life changed was relentless. Sometimes in my reporting, I kind of wished that I could see Min once and not have her have a big change so we could just sit back and talk a little bit. But every time there was something new to figure out and learn about. Jakes: One of the things that gives the book its richness is that you weave together the stories of these migrant women with the stories of your own family’s migrations. You lived in China for more than a decade before you started to dig into your family history. Why was that? What made you reluctant to do that for so long? Chang: It’s probably just my contrarian instinct. I felt like it was kind of a cliché to be a Chinese-American, to move to China for work and immediately seek out your family village and find some kind of spurious link to the past. I didn’t want to do that. When I first lived in China, I was really struggling to figure out what kind of stories I wanted to write and even though I didn’t put it into these words at the time, I think I felt that I wasn’t ready to understand and appreciate what I would find if I delved into my family history. Jakes: You write in the book that you began to explore your family history around the same time as you started work on the book, but that the two projects initially weren’t related. What did make you choose that moment to start research on your family? Chang: Initially, it was logistics more than anything else. I was on book leave from the Wall Street Journal and my time was my own much more than it had been when I was on staff. So as soon as I took the book leave, that’s when I went to Min’s village to visit her when she returned there for Chinese New Year. And when I came back, I decided I wanted to go to my ancestral village. I can’t say that there was an explicit connection. I wish I could say there’d been more thinking behind it, but there wasn’t. It was mainly logistical. So I went to this little village of Liutai in Jilin province and spent just a few hours there. It was a farming village with kind of a typical profile—a lot of the young people had moved to the city. My grandfather had been born in this village and left for Beijing when he was a teenager to go to school and then went abroad. So I came back from that trip and I hadn’t turned up much, but it was evocative to me to feel like I’d tried to find where my family had come from. I came back and started thinking about that village and Min’s village, my grandfather’s story and the migrants’ story and I felt like there were links. Not perfect parallels by any means. My grandfather was very educated and he went to America for school and that’s very different from what the migrants experience. I’m not trying to overstate the similarities. But I felt like his moment in Chinese history and this moment contain parallels. In both cases China was opening up to the world after a long period of isolation. This opening up is also internalized in individuals. People are thinking, “How do I fit into the world? How do I become a modern person?” I thought that exploring my grandfather’s encounter with the world and how he dealt with it and how the migrants did it would be an interesting way to frame the book. Jakes: Once you started working on the two pieces together, how did your research on your family color your thinking on the migrants and vice versa? And when you were doing the reporting did you tell each side that you were planning to put them in the same book? Chang: I did. I did. And everyone said, I have no idea how you’re going to make this work. All my relatives were extremely skeptical about how I was going to make it fit together. I basically stopped telling people too much about the project. I felt like while it was underway, it took too much explanation and sowed too many doubts in me. But I had a kind of instinctive feeling that it could work and I at least wanted to try. Jakes: And so how did these two parts of the book come together and how did they influence one another? Chang: I think some of the parallels really pleased and surprised me. I explained to you that I only learned about Chunming’s diaries after the fact. And in the same way, I was researching my family history for more than a year before, offhand, I asked my dad if my grandfather had ever written anything that he had. And he said, “Oh yeah, I have two diaries. They’re very uninteresting, but you can look at them if you want.” Reading the diaries, which were very difficult for me and required my working with a Chinese graduate student to decipher some of the classical Chinese writing, I realized that my grandfather was engaged in kind of a similar endeavor to what Chunming had been engaged in. So there were many parallels. But overall, reporting my family story in parallel with reporting the migrants’ story made me feel like Chinese people have come a long way, and, in general, it’s a good thing. I felt like the people I was learning about in my family were, in many ways, trapped inside a lot of traditional ideas about family and history and how they should behave. And I felt like the young women I met in Dongguan were completely liberated from that. It’s partly a function of class. They don’t have the education and so they don’t have the kind of burdens that an educated Chinese person has. But I think it went beyond that. It’s a different moment in Chinese history and people are more liberated from all of the obligations to family and history and the past. Jakes: But what makes family obligations and tradition things from which someone ought to be liberated? Can you explain what you mean? Chang: In talking to my own family, I felt like everyone had done what was expected of them. This was the case with my grandfather, who went to America in the 1920s and his great love was literature and humanities and history, but instead he studied mining engineering, because he felt like this was the best thing to help China. And in his diary it becomes clear that he’s just not interested in mining engineering, but he’s doing it for a higher purpose. My Dad went to America and studied electrical engineering even though he’d always been an incredibly vocal, fluent person and the thing he was most interested in studying was law and politics. He felt like there was no future in that and he had to go to America and so he studied electrical engineering. He had a very good career and then retired early and went to Hong Kong to help start up the Hong Kong University of Science and Technology. In the course of my research I read this interview with him—it’s kind of funny to read an interview of your father—in a Hong Kong magazine, and the reporter was asking him, “How come you decided to come to Hong Kong?” And he said, “I really wanted to do something for China and this is the first act in my whole life that I’ve chosen to do that wasn’t something that was expected of me.” It’s kind of weird to read an interview of your father when he says that. I think that made a deep impression on me. It’s not to imply that he wasn’t happy with his life, but there were just a lot of restrictions and expectations on people of his generation and earlier generations and I think a lot of those have disappeared. Jakes: You’re Chinese Ameican and you look Chinese and that gave you a kind of access and when you wanted it, a kind of anonymity that enhanced your ability to report. How else do you think that coming from a Chinese family affected the way that you came to understand and tell these stories, if at all? Chang: I think that coming from a Chinese background, being Chinese-American, there can be a lot of emotional baggage. I saw it in other Chinese-Americans I knew. Certain people embrace this Chinese identity all the way. They hate the Japanese for what they did during the Nanjing massacre. Others embrace the Communist Party and think everything China does is good and are very defensive whenever anyone criticizes anything about China. I think it’s a difficult process to come to terms with what your Chinese identity or your Chinese heritage means and I think there are many pitfalls to that. And I always say, “Well I don’t want to burden people with this the minute I meet them. What if they don’t know how to react when I tell them my grandfather was killed.” And I realize that’s a very Chinese reaction—maybe not just Chinese—but in that way a Chinese reaction, the will to withhold information and to keep the things that matter most to you rather than spilling them out right away. Talking with my relatives, after talking for two hours they would reveal at last some terrible detail about someone who had committed suicide or the fact that they only had one memory of their father to carry through their whole lives or some incredibly poignant detail that they had not told me until that moment. And you know, I understand why they would do that and it seemed to reflect how I react to certain things as well. Jakes: In the book, mostly you use the stories of your family to contrast the stories of the migrant women. But there are also links. Do you think that’s more because these are Chinese stories or because they’re both about leaving home? Chang: Definitely the latter. I think the story of leaving home, going to a strange place and making a new life is universal. And I did think while writing it that while I know China is very distant for most Americans, I hope Americans reading this will feel like this is the story of their ancestors as well. And obviously without downplaying all of the differences in China’s history and China’ situation, this is kind of a universal story. That was also one of the motivating factors for my reporting on migrants in the first place. When we talk about the American migration story, whether from Europe or from somewhere else, it isn’t a story of pure privation and desperation and horrible conditions although all those things existed in some form. It’s really a story about opportunity and adventure and a new life. And I felt like the story of the migrants leaving their villages for the city might have some similarities with that story. Jakes: At one point early on in the book, you visit a history museum in Dongguan and it’s kind of a funny part of the book. The museum doesn’t have anything in it about Mao, most if its displays are about the growth of factories. History and the way it’s written and the way people think about it is a persistent sub-theme in Factory Girls. Could you say something about how history functions for the book’s different protagonists? Chang: I think, as I say in the book, that the Chinese have a very complicated relationship with their own past. For traditional scholars, the past is living and the past is to be constantly studied, for meaning, for moral examples, for guidance on how to move forward. And I think for my grandfather and my father’s generation that was very much the case. But then you have this very traumatic recent history of China from the 1950s to the 1970s when, in many cases, unspeakable things happened and people who are still alive today committed a lot of these unspeakable acts, to people whom they knew or were friends with or possibly were related to or worked with. So you have this kind of abstract pride in history, but then you have this recent history that you participated in that’s extremely problematic and traumatic and impossible to explain. So then there’s this young generation that I write about, who are going to the factories, who I think are completely removed from history, cut off from history. They have no history and they can be liberated from China’s traumatic past. But I don’t think that means that everything is fine. I think that under the surface this very troubled history is still there and some point it needs to come out and be dealt with. But right now it’s just kind of under the surface. There’s a kind of agreement among most Chinese people with each other with themselves which is just not to deal with it. I kind of think as Westerners we look at China and think that history is this open wound and people are trying to work through these terrible things that happened during the Cultural Revolution. I think that’s a very Western approach. We feel like these things need to be dealt with, explored, to ensure that they won’t happen again. And I think the Chinese that I write about, my older relatives both inside and outside of China, their response to these traumatic events is to put them aside and not think about them. I don’t think it’s an open wound, I just think it’s something they kind of hold inside themselves and at some point they’re going to have to deal with it. But most people are basically pretty fine, not dealing with it. One of the things I did feel in Dongguan and also from reporting my family’s story—my family suffered a lot during the Cultural Revolution—was that I felt like this moment in history could not have happened without the traumatic events that preceded it. China now, with people so pragmatic, so focused on just improving their lives, getting the next good thing—I think that’s a direct response, even an unconscious response to the traumatic historical events experienced by the previous generation. I definitely feel like the world in Dongguan is a pretty brutal world. It’s pretty corrupt. There’s a lot of misinformation. People make major life decisions on wrong-headed ideas. You see that in the book with Chunming and all these crazy schemes and fads that she embraces one after another. So definitely I’m not trying to portray this modern world as represented by Dongguan as an ideal world, by any means. But I do think that the opportunities that these young women I write about have to try to make a new life and search for some meaning, I think that’s new, and I think it’s worth understanding and even celebrating. wow, very interesting interview. I am reading "Factorty Girls" right now and am unable to put it down. An excellent book.